Having some basic skills in debugging Go programs can save any programmer a good amount of time trying to identify problems. I believe in logging as much information as you can, but sometimes a panic occurs and what you logged is not enough. Understanding the information in a stack trace can sometimes mean the difference between finding the bug now or needing to add more logging and waiting for it to happen again. I have been seeing stack traces since I started writing Go. At some point we all do something silly that causes the runtime to kill our program and throw a stack trace. I am going to show you the information the stack trace provides, including how to identify the value for each parameter that was passed into each function. The stack trace in listing 2 shows all the goroutines that existed at the time of the panic, the status of each routine and the call stack under that respective goroutine. The goroutines that were running and the one that caused the stack trace will be at the top. Let’s focus on the goroutine that panicked. The stack trace on line 01 in listing 3 is showing that goroutine 1 was running prior to the panic. On line 02, we see that the code that panicked was in the Example function in package main. The line indented shows the code file and path this function is located in, plus the line of code that was executing. In this case, the code on line 09 was running which is the call to panic. Line 03 shows the name of the function that called Example. This is the main function in the main package. Underneath the function name once again, the line that is indented shows the code file, path and line of code where the call to Example was made. // Call to Example by main. Listing 4 shows the values from the stack trace that were passed into the Example function when the call was made by main and the declaration of the function. When you compare the values from the stack trace with the function declaration, it doesn’t seem to match up. The declaration of the Example function accepts three parameters but the stack trace is showing six hexadecimal values. The key to understanding how the values do match up with the parameters requires knowing the implementation for each parameter type. Listing 5 shows how the first three values in the stack trace do match up with the slice parameter. The first value represents the pointer to the underlying array of strings. The length and capacity numbers used to initialize the slice match with the second and third values. Those three values represent each value of the slice header, the first parameter. Listing 6 shows how the fourth and fifth values in the stack trace do match up with the string parameter. 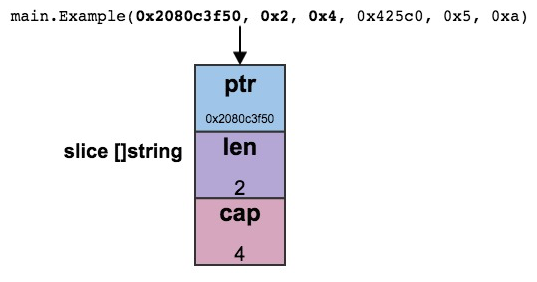 The fourth value represents the pointer to the underlying array of bytes and the fifth value is the length of the string which was 5. The string "hello" requires 5 bytes. Those two values represent each value of the string header, the second parameter. Listing 7 shows how the last value in the stack trace matches up with the integer parameter. The very last value in the trace is hexadecimal number 0xa, which is the value of 10. The same value that was passed in for that parameter. That value represents the third parameter. Listing 8 changes the original program by declaring a new type named trace on line 05 and converting the Example function into a method on line 14. The conversion is accomplished by re-declaring the function with a pointer receiver of type trace. Then on line 10, a variable named t is declared of type trace and the method call is made with the variable on line 11. The first thing you should notice in listing 9 is that the stack trace on line 02 is making it clear this was a method call using a pointer receiver. The name of the function is now displayed with (*trace) between the package name and the method name. The second thing to notice is how the value list now shows the value of the receiver first. Method calls are really function calls with the first parameter being the receiver value. We are seeing this implementation detail in action from the stack trace. Since nothing else changed with the declaration or call to the Example method, all the other values remain the same. The line numbers where the call to Example is made and where the panic occurred changed and reflects the new code. Listing 12 shows how the value in the stack trace matches up with all four parameter values that were passed in. The value of true is an 8 bit value that is represented with the value of 1 and the value of false is represented with the value of 0. The value of 25 in binary is 11001 which converts to 19 in hexadecimal. Now when we look at the hexadecimal value represented in the stack trace, we see how it does represent the values that were passed in. The Go runtime provides a great deal of information to help us debug our programs. In this post we concentrated on stack traces. The ability to decode the values that were passed into each function throughout the call stack is huge. It has helped me more than once to identify my bug very quickly. Now that you know how to read stack traces, hopefully you can leverage this knowledge the next time a stack trace happens to you.